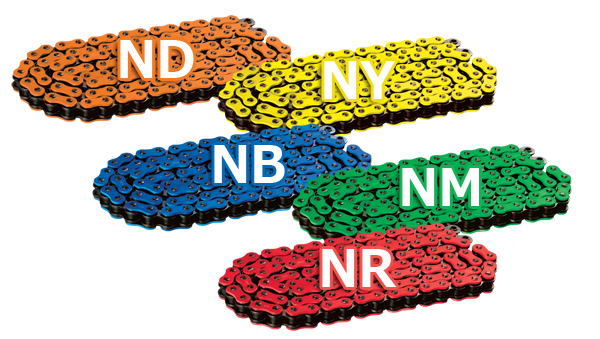 FWR chain has newly developed to be the ultimate choice for superbike racing both sprint and endurance. Combination of the latest RK racing technology of "UW ring" and forged emboss outer link plate is the lightest drive train equipment to minimize the loss of power transmit from engine to driven axle. Vivid Gold (VG) color exclusively plated on the components is the identity that certifies ultimate performance in the circuit. UWR chain is designed for racing motorcycles to excel competitors' especially, seeking for the advantage in the high speed battle. The thinnest "UW-ring" technology makes more 10% lightweight than other conventional road chain. Accurate assembly of high carbon alloy steel components bears against enormous engine power and tension stress, which is the cleverest choice for downsizing conversion from 525 or 530 chain. GXW chain is the top grade of RK road chain, assembled with the “XW-ring” technology made of an advanced Nitrile Butadiene composite and features three contact lips and two convex outer stabilizers. This means three lubrication pools to protect against high speed abrasion, extreme heat build up, torsional flex and loss of lubricant. The “XW-ring” provides the user with more than double longer wear life than standard o-ring chains. XSO chain is intermediate grade of RK road chain, assembled with “RX-ring” feature an X-ring shaped seal. Viewed in cross-section, the “RX-ring” has two lubrication pools and seal points versus the single seal point/pool design of a regular o-ring chain. “RX-ring” technology offers less torsional friction, increased high-stress performance, and a 50% longer wear life compared to standard o-ring chains. KRO chain is standard grade of RK road chain with "O-ring" feature made from an advanced Nitrile Butadiene composite for maximum performance and wearlife. All RK O-ring chain is made by high precision assembly technology optimized for grease sealing and friction control. Components are heat treated hi-carbon alloy steel with seamless rollers and shouldered bushings.